I am honored to feature my friend Erica Toles as the sixth Natural of "A Hair Story". She was so kind to let me interview her on her lovely Hair Journey. Erica: I was tired of getting perms due to my sensitive scalp,I often got chemical burns and I felt my hair was thinning in some places due to the perm. I started researching natural hair and I found it to be such a beautiful thing because women of color were no longer ashamed of their natural kinks it was so great to see women embrace their natural beauty! Erica: While transitioning, I wore styles such as....Braid outs, twist sets, roller sets, and braids. I encourage anyone who's afraid of going natural to transition. While it my get tough, as long as you wear protective styles you will have a smooth transition and should experience less breakage. I transitioned for 6 months and grew frustrated with the two textures so I decided to do the BC. I must say that was the best decision I made, my scalp can breath and its growing a lot faster. Erica: "Crack is Wack" J/K, I feel at some point everyone should try to go chemical free, Although the perm looks very nice and straightens the hair; it is very damaging. I felt so liberated after going natural, I'm so happy because I chose to go back to my roots! Erica: Actually it did, Now I feel as if I can do anything I put my mind to. I was afraid at first of trying new things (the unknown), but now the skies the limit. I FEEL FREE!! Natural Expression: What would you tell someone who's considering natural hair? And why they should, or shouldn't? Erica: Just do it, but first do your research; there is a lot of maintenance that we have to consider while transitioning or going natural. I would tell them that it's a healthier way for the hair to grow. "Why not embrace those beautiful curls, that's how you were born". Natural Expression:What products are you currently using? Erica: I am currently using Cantu, same products I used while transitioning. 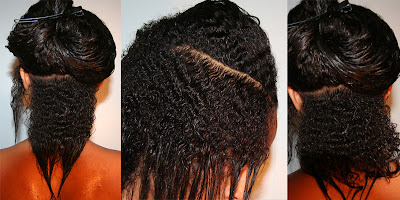 I have also tried the Shea Moisture "Curl Enhancing Smoothie". I also use tea tree oil. I plan on trying out the line of natural hair products by Design Essentials. Erica: I usually wash my hair twice a week due to my dry and itchy scalp. If I don't get around to washing my hair I will co-wash it with my Cantu conditioner then put in the leave-in. I try one a month to do a deep condition then I oil my scalp with a Shea butter, grape seed oil, olive oil, coconut oil, carrot oil mixture. Next time I'll add Joboba oil that is something I forgot to put in. My favorite hairstyle is the curly fro. Group Name is: Going back to my Roots! (Happy being Nappy)...Please Join! Thank you Erica for telling your "Hair Story" and I wish you the best in all that you do, and much more hair growth. Stay Natural...Much love to you! Very nice story. Wonderful progress from then to now. Very inspiring!